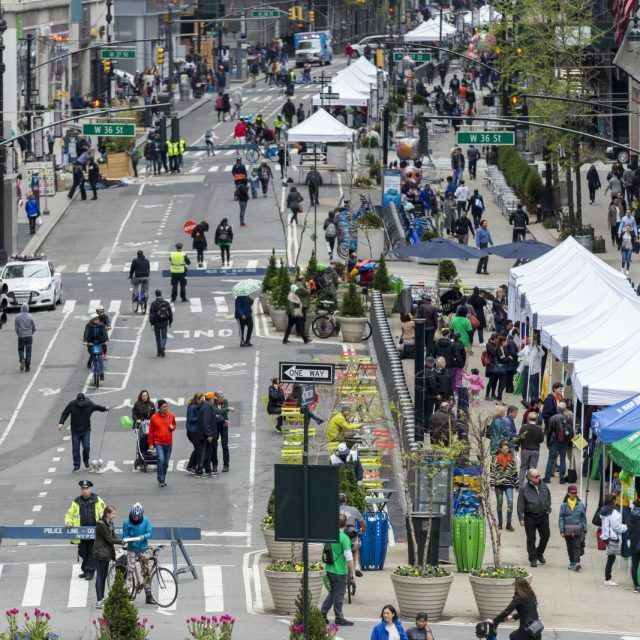 Lincoln Square, a part of the Upper West Side, is a literal square of approximately 50 blocks that runs east-west from Central Park West to the West Side Drive and north-south from 59th to 72nd Streets. 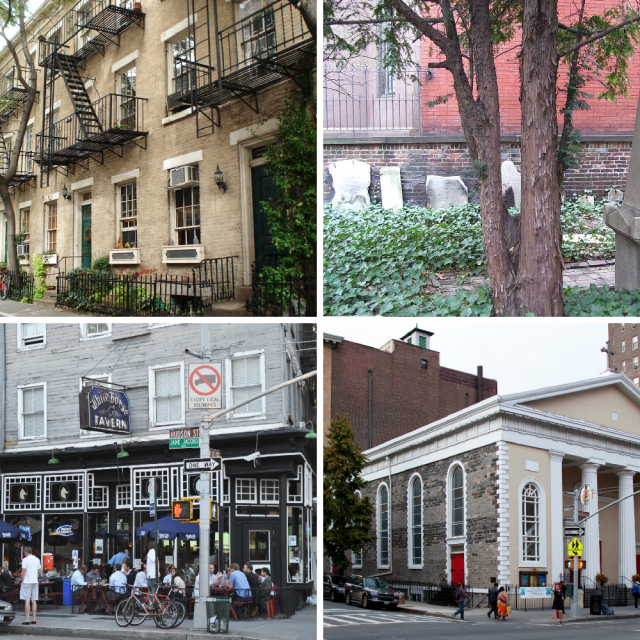 The neighborhood, which is bisected by Broadway and contains the Lincoln Center “superblock,” has an enormous amount of culture, loads of prestigious schools, tons of old-school luxury residences lining the park, and a massive, five-acre, four-building new development called Waterline Square, finalizing a decades-long master plan for the neighborhood. 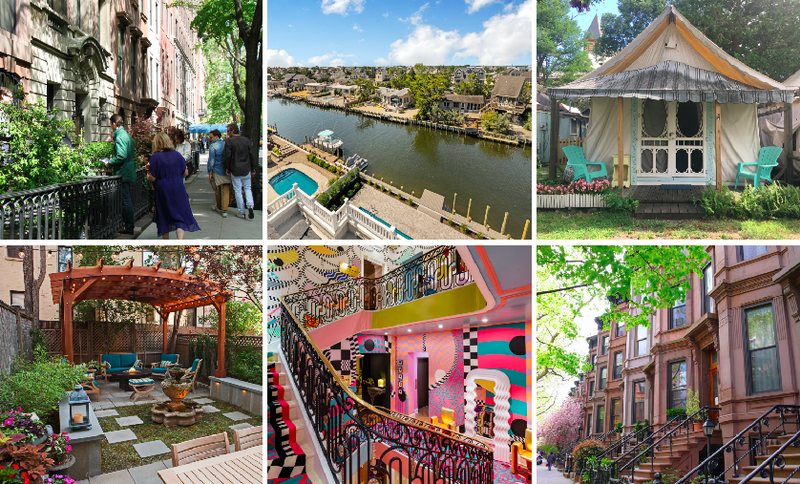 Ahead, we take a look at the neighborhood’s history, from its Dutch roots to Robert Moses’ slum clearance, modern residential development, and all the amenities that make this area more fun than one may think. 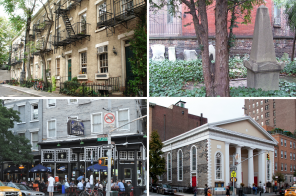 When the Dutch first settled Manhattan, the Lincoln Square area was known as Bloomingdale (or “Bloemendael,” by early settlers) in reference to a flower-growing region of Holland. The urbanization of Lincoln Square came on strong in the late 1800s, only to fall into disrepair relatively quickly. 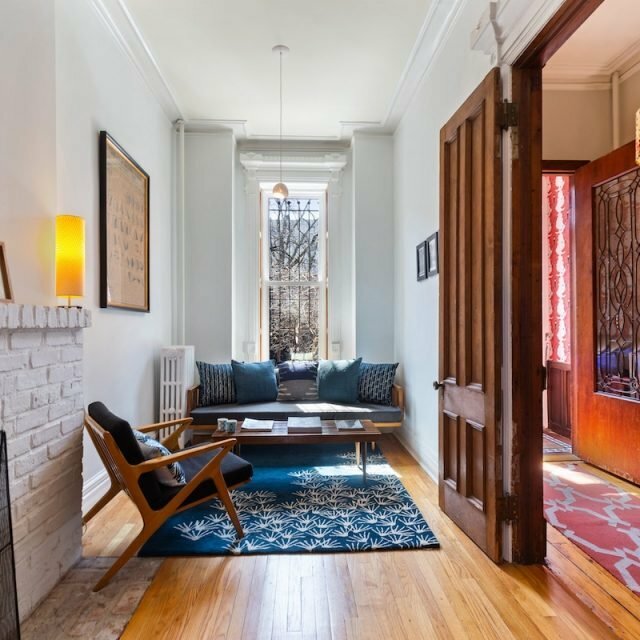 Most of the Upper West Side brownstones were built in the late 1890s for middle-class families. But by the 1950s, those brownstones had been broken up into tiny apartments and neglected by absentee landlords. After being known as Bloomingdale, Lincoln Square was referred to as San Juan Hill. In the early 1900s, San Juan Hill was a predominantly African American neighborhood filled with tenements. The area had so many residents, that it’s been reported up to 5,000 people lived on a single block. Legend has it that the area was named after the segregated black 10th Cavalry that fought with Theodore Roosevelt at the Battle of San Juan Hill during the Spanish–American War in 1898. 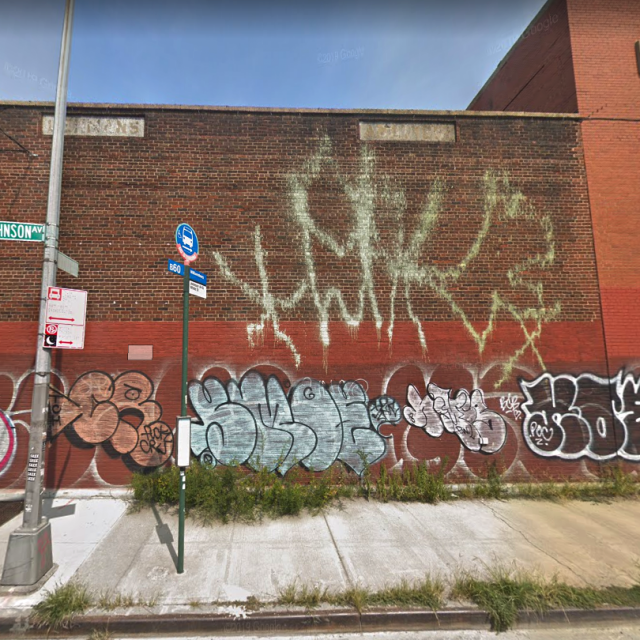 Unfortunately, the area also became wrought with gang warfare between African-American gangs from the neighborhood and Irish-American gangs from nearby communities. 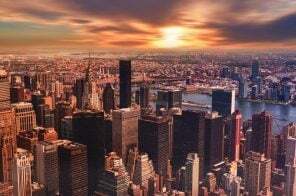 In fact, the setting of “West Side Story” was inspired by the frequent clashes between the black residents of San Juan Hill and Irish residents of Hell’s Kitchen. The 1961 film’s opening scenes were even shot in the neighborhood. In his typical fashion, Robert Moses took this as an opportunity in the 1950s and 60s to create the urban renewal “Lincoln Square Renewal Project.” Under his slum clearance plan, 18 blocks of the old tenements were demolished, displacing 7,000 lower-income families and 800 businesses. In their place, he built the Amsterdam Housing Projects in 1948, where close to none of the new housing units were intended for the original residents. Later, in the ’60s, backed by heavyweight civic leaders including John D. Rockefeller III, Moses began work on the 16-acre Lincoln Center for the Performing Arts. 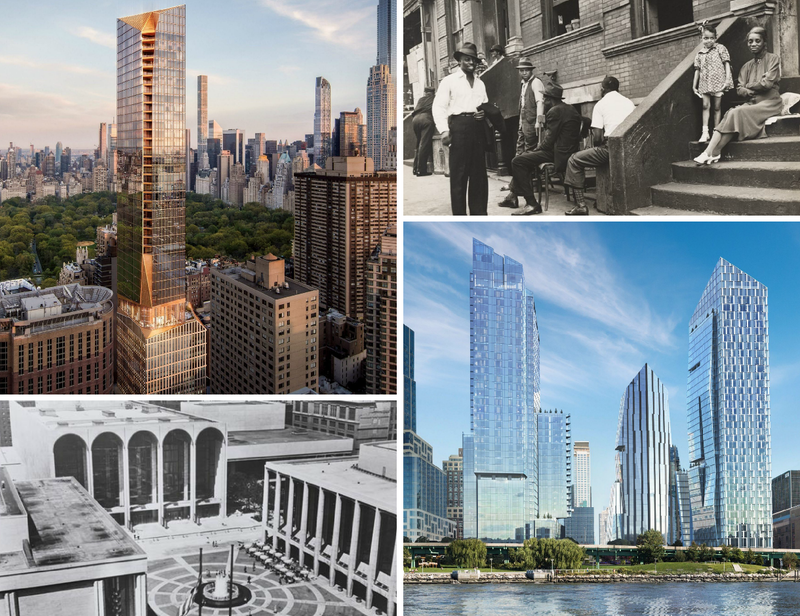 As the decades progressed, the surrounding and remaining residential areas grew in fashion, thanks mainly to the proximity to Lincoln Center, multiple train lines, Central Park, and those brownstones still remaining. 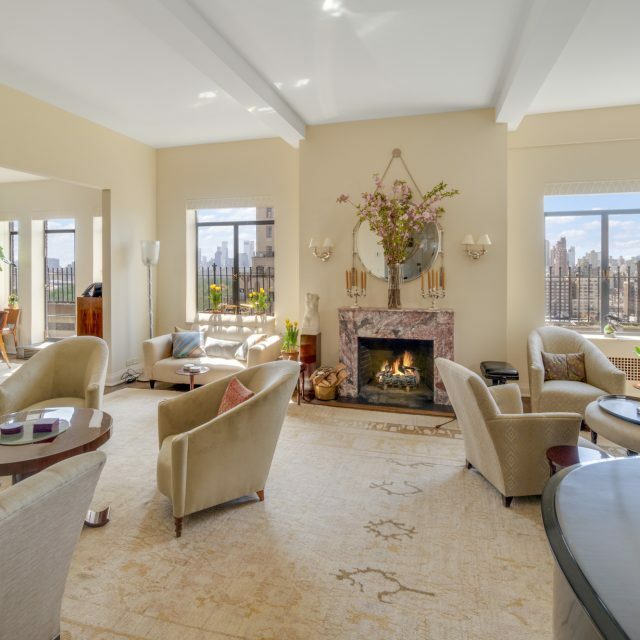 A decade after it was completed, Robert A.M. Stern’s 15 Central Park West still reigns as the most expensive condo in New York City, averaging $6,405 per square foot. But there are plenty of new developments springing up nearby that’ll likely give it a run for its money (though some are more welcomed than others). 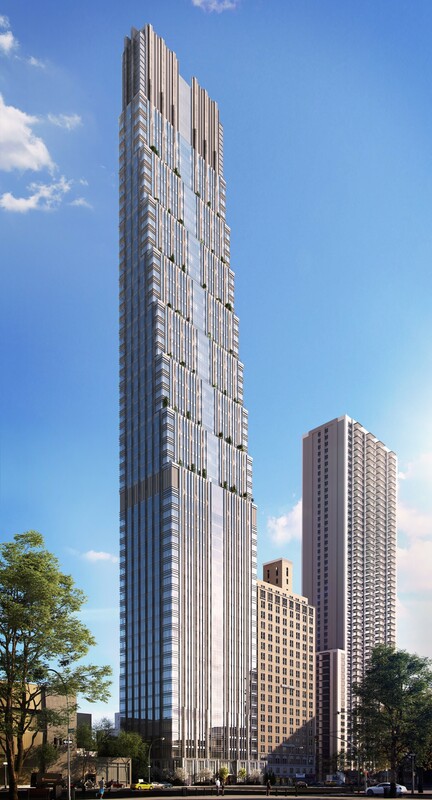 200 Amsterdam Avenue is a planned 52-story, 668-foot condo tower from developers SJP Properties and Mitsui Fudosan. 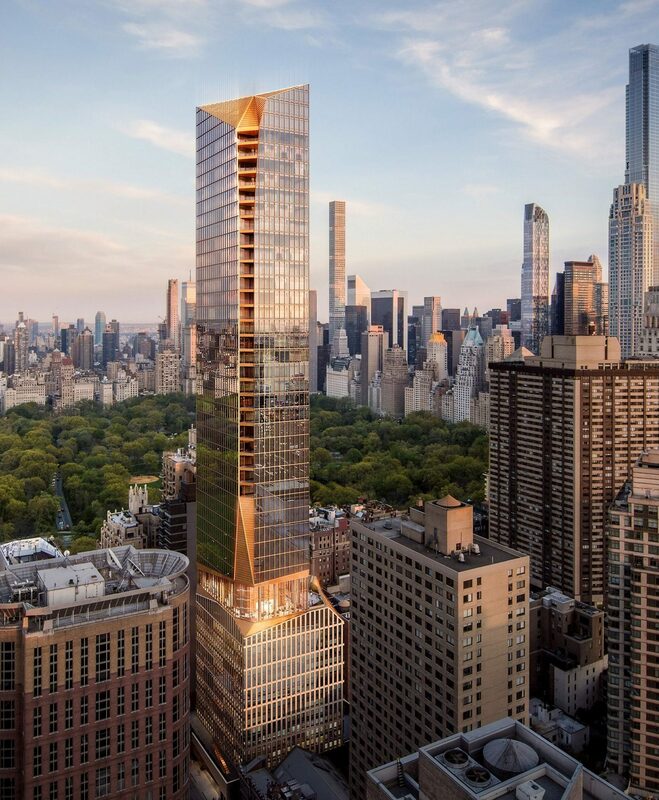 The 112-unit building was slated to be the tallest on the Upper West Side until Extell increased the height of their proposed tower at 50 West 66th Street to 775 feet tall. 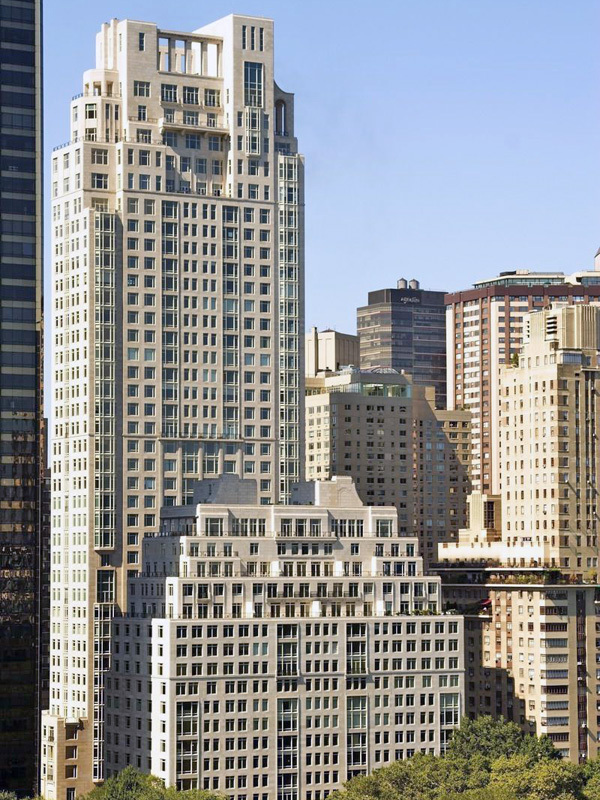 Designed by Elkus Manfredi, 200 Amsterdam has an Art Deco-inspired facade with an aluminum curtainwall and metal panels. 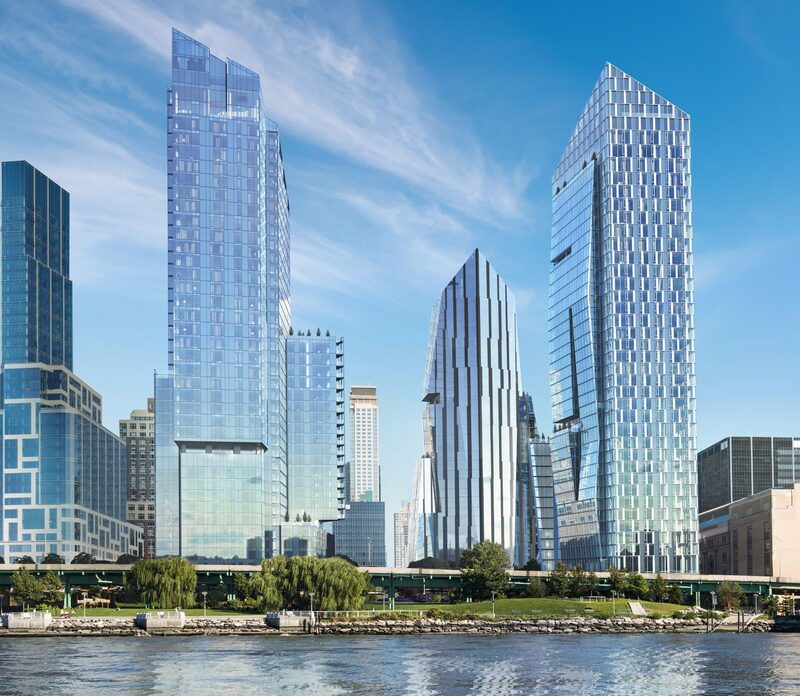 Construction on 200 Amsterdam was stalled after critics argued the project did not follow required open space regulations and the city’s Department of Buildings shut down the site in July  until the issue was resolved. 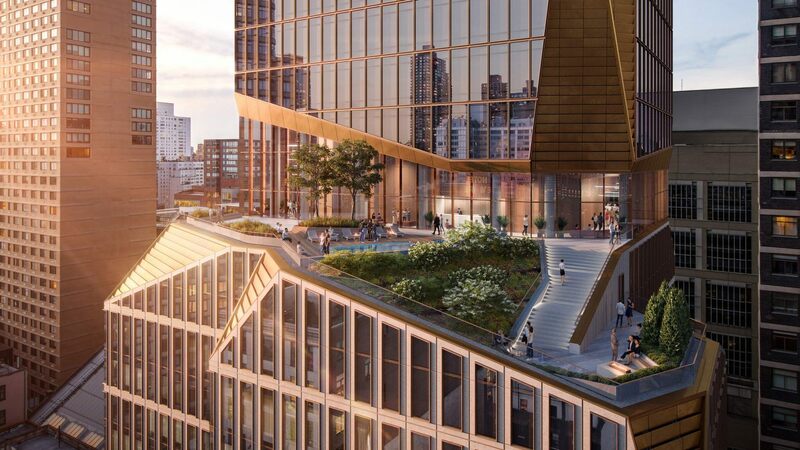 In October, developers approved SJP Properties’ revised plan, which added unused air rights from other sites and connected them back to the project’s lot. But in March of this year, opponents of the tower fought to block the condominium building based on a technicality. 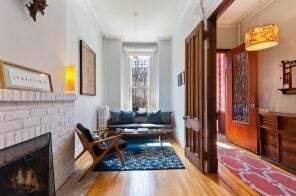 According to the New York Post, the Committee for Environmentally Sound Development, an activist group led by neighborhood preservationist group Landmark West!, used a 1978 Department of Buildings air rights memo that misinterprets the department’s allocation of air rights. The fight is far from over but it is a small coup for LW! 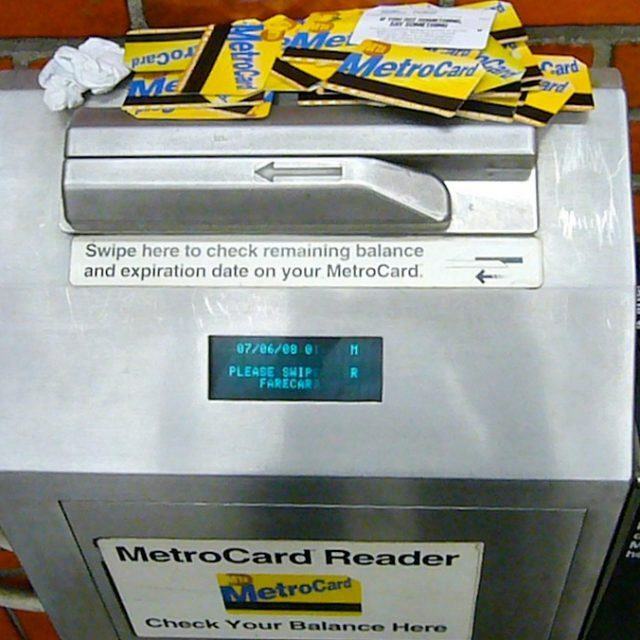 A follow-up hearing was scheduled for June 5th, but for the second time, the NYC Board of Standards and Appeals has postponed the decision until July 17th. Gary Barnett, the founder and president of Extell, initially filed plans with the Buildings Department for a 25-story building. 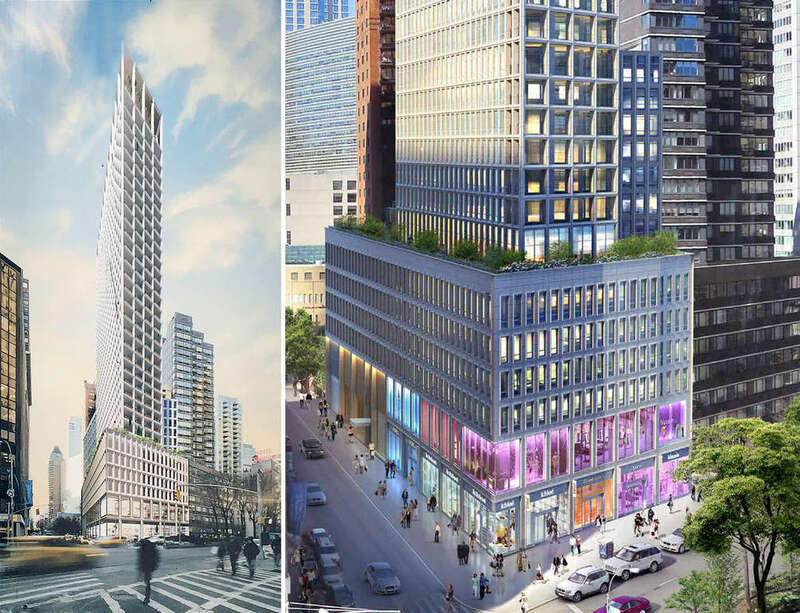 Opponents of the project claim Barnett used a “bait-and-switch” tactic, as the building’s new height is three times what Extell had first reported. Barnett says he’s not worried and has tapped a zoning lawyer who’s arguing that “current zoning laws allow for a skinny tower of unrestricted hight as long as the bulk of the building is in a podium that does not exceed 150 feet tall.” As of March, demolition had begun at the site. 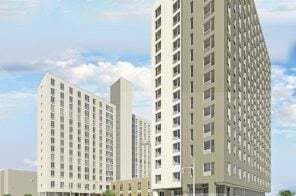 If all goes according to Extell’s plan, the 127-unit tower will be completed in 2019. The design is achieved through a series of sculptural excavations, evocative of the chiseled stone of Manhattan’s geologic legacy. As the building rises, its bulk is carved away, splitting the tower volume into two. Chamfered corners refine its silhouette and form a shared amenity terrace on the 16th floor. Amenities will include an indoor pool, full basketball court, squash court, and bowling alley. 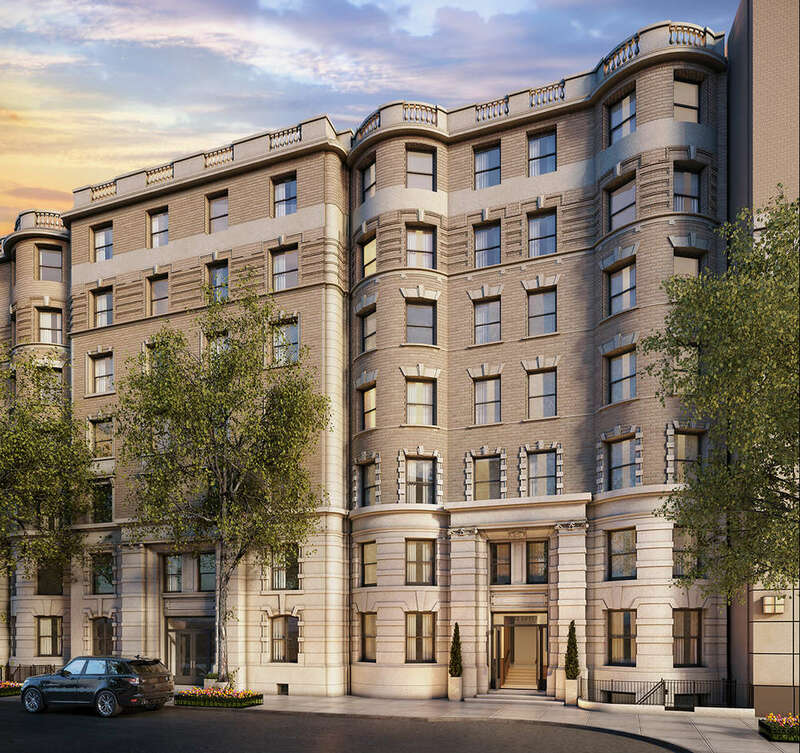 The 16th floor, with one of its structural excavations, will be dedicated to additional resident amenities centered around a landscaped terrace with an outdoor pool, spa, and fire pit. 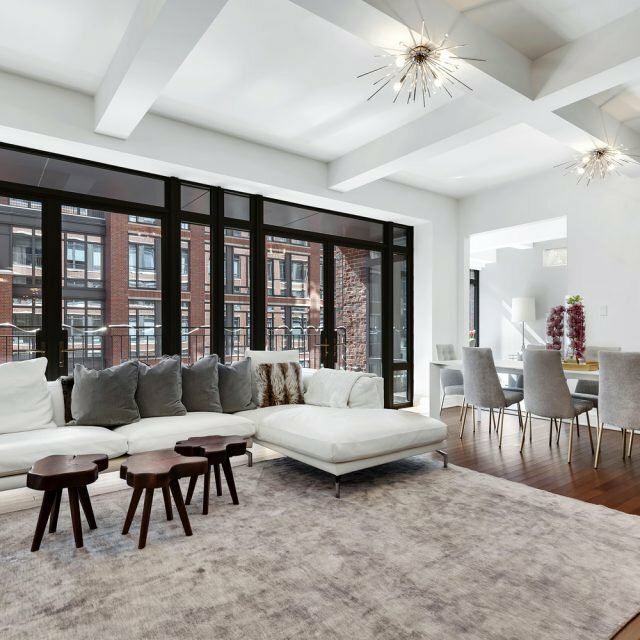 The DXA Studio-designed boutique residence has 38 apartments, ranging from two- to four-bedrooms. 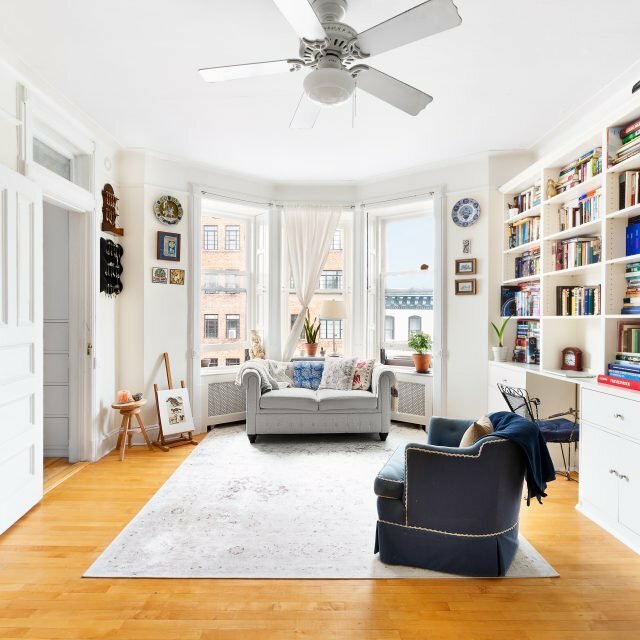 Its location on a cul-de-sac between Riverside Boulevard and West End Avenue means there’s very little traffic but the building is still accessible to Riverside Park. Despite being a small building, the building’s amenities are comparatively robust. 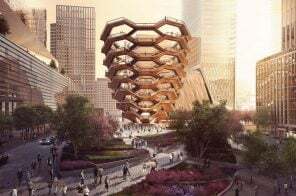 There is a 24-hour attended marble-clad lobby, a wood-paneled library, a landscaped rooftop terrace with a furnished dining area, gas grill, and lounge seating, a fitness center including Peloton cycling equipment, children’s playroom, bicycle storage, and individual storage units. 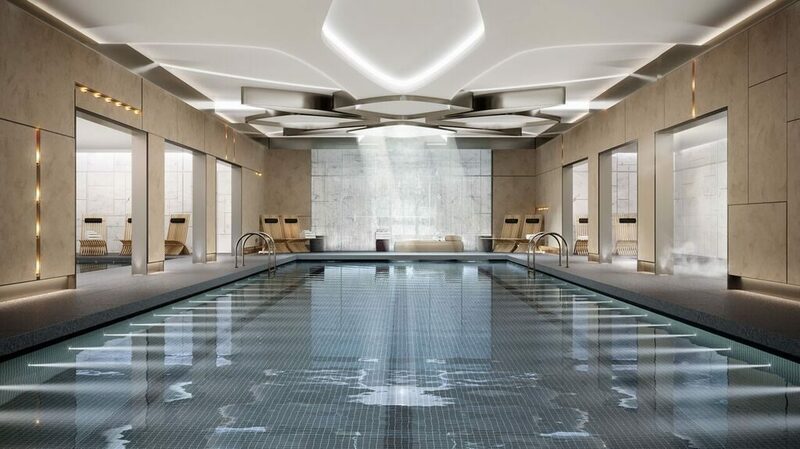 Speaking of robust amenities, Waterline Square takes that to a new level with their 100,000-square- foot facility designed by David Rockwell. 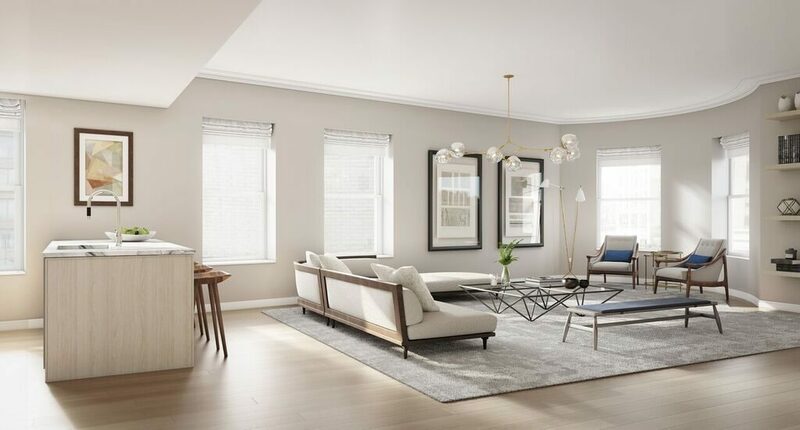 With early 2019 occupancy expectations, Waterline Square is a trio of luxury residential high-rises, sitting on nearly five acres along the Hudson River, from West 59th Street to West 61st Street. The entire, four-building (three residential buildings and one amenity facility) is centered on a 2.6-acre, beautifully-landscaped park and open spaces, the Waterline Club connects all three buildings and has been designed by famed hospitality group, Rockwell Group. Each building has its own starchitect-designed personality, its own team of interior designers. Richard Meier’s One Waterline Square rises 37 stories and will have 288 condo units. 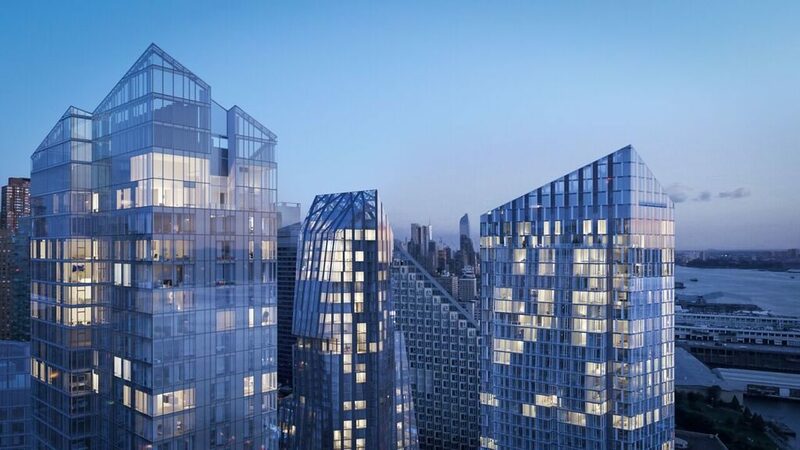 Kohn Pedersen Fox’s Two Waterline Square rises 38 stories and will have 160 condos. 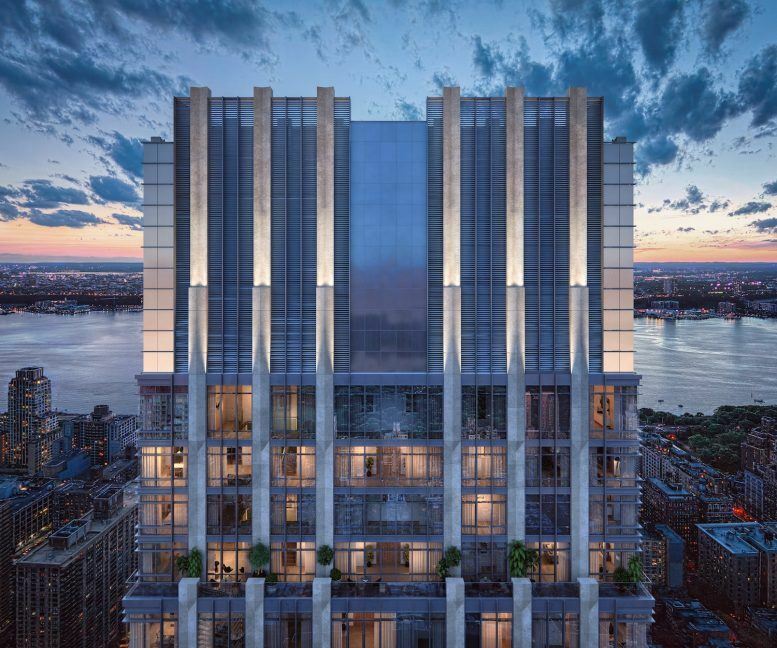 Rafael Viñoly handled the 34-story Three Waterline Square, which will have 200 units, high-end condos on the upper floors and rentals below. 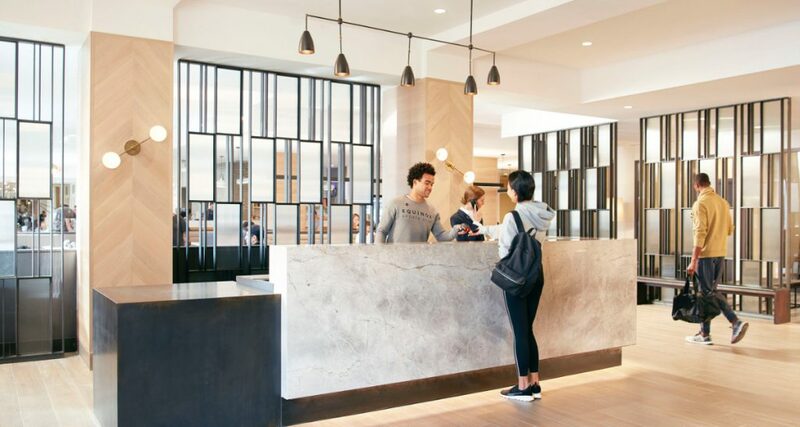 The common amenities includes a state-of-the-art fitness center, an indoor basketball court, indoor tennis court, soccer field, bowling alley, and a 25-meter, three-lane lap pool for those looking to get a workout outside of the traditional fitness center. 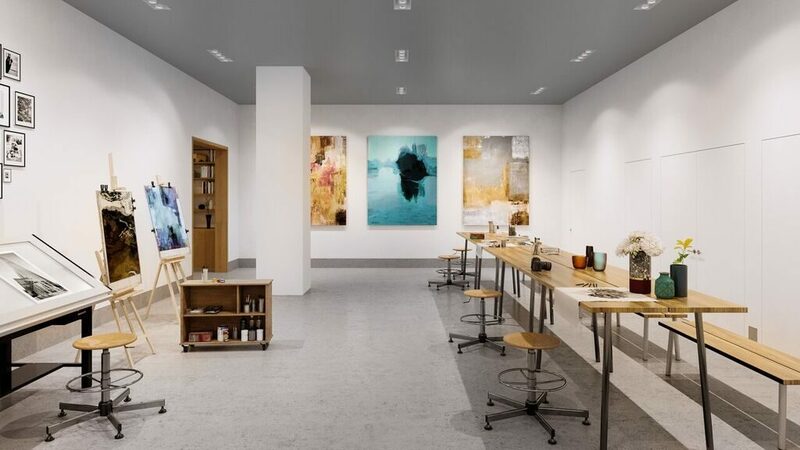 Other amenity highlights include an art studio, music studio, indoor gardening studio, and specialty zones for children and pets. Also, the first-ever Cipriani food hall will open at Waterline Square, offering a 28,000-square-foot food hall with a market and restaurants at Two Waterline Square. 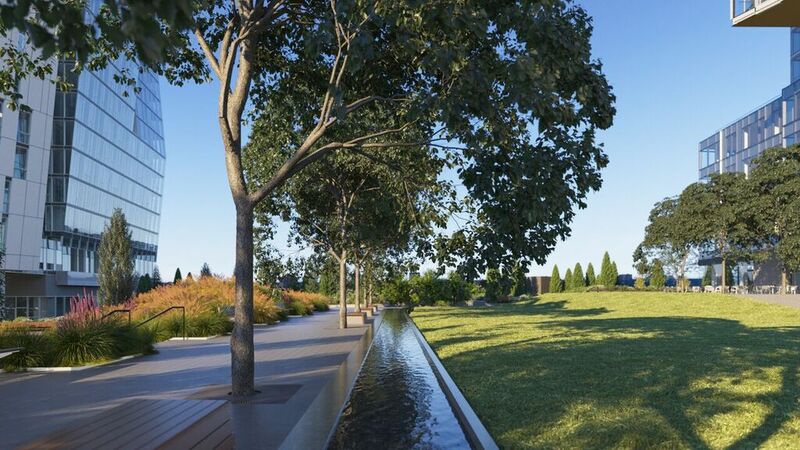 Aside from the outrageous amenities, what really makes Waterline Square stand out is its park designed by Mathews Nielsen Landscape Architects. It includes tree-lined groves, open grass areas, walking paths, a playground and water features. 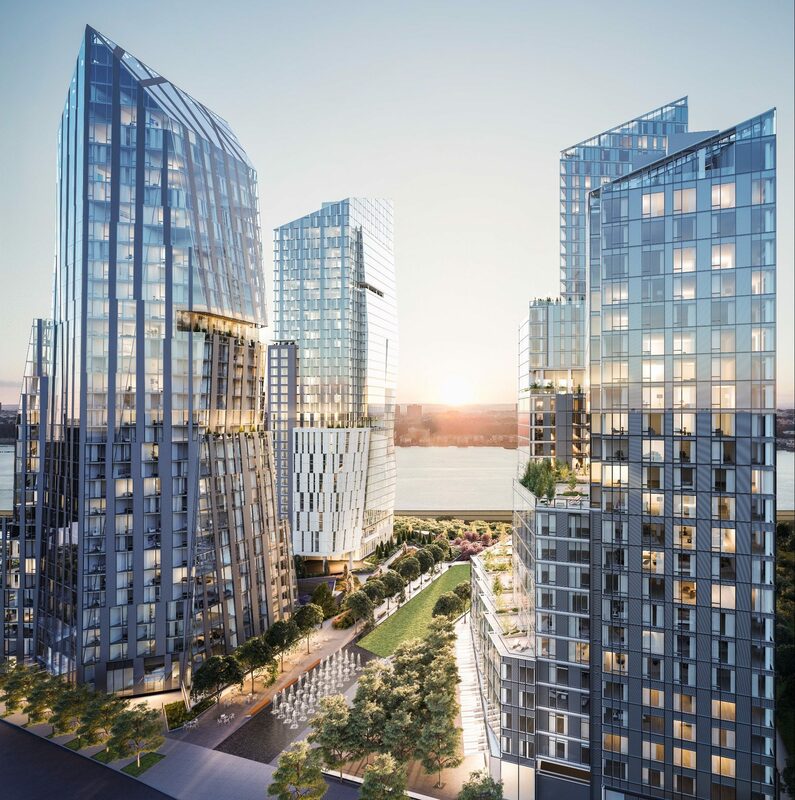 Waterline Square is the final phase of the final phase of the Riverside South master plan: a 77-acre plot of land that shoulders the Hudson River from West 59th Street to 72nd Street, and was once home to a freight rail-yard owned by the Penn Central Railroad. Linsley says, “after a multi-decade master plan to come to completion, our project, in itself is pretty special, but it is also the exclamation point at the end of this massive project.” The project is expected to be complete later this year. This 33-story tower is being built on the former site of the American Bible Society building (the organization sold to move to Philadelphia in the fall of 2015). 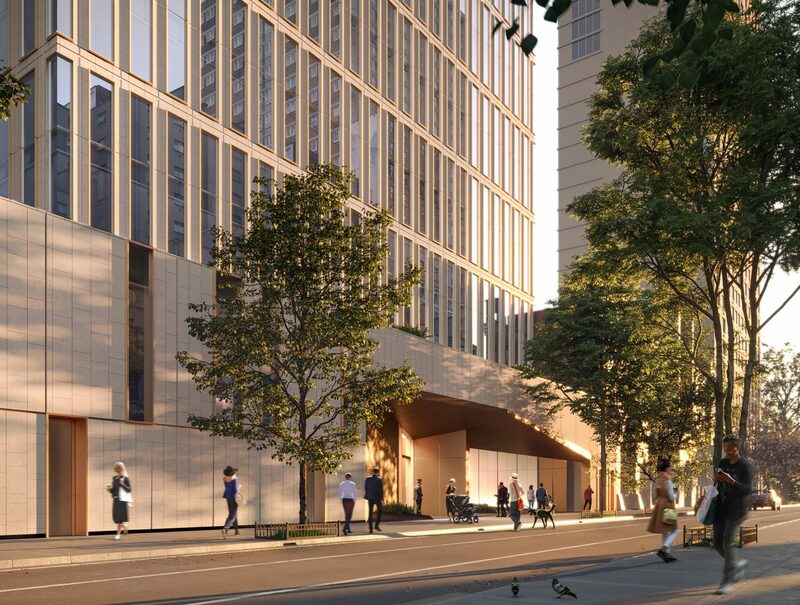 Developers AvalonBay Communities are building a 416-foot, concrete superstructure designed by Skidmore Owings & Merrill (SOM). Although Avalon usually builds rentals, this building will be a mix of condominiums and rentals, with 160 total units. The amenities will include a pool, a game room, fitness center, several lounges, a communal pantry, a roof terrace, bicycle parking and tenant storage. There will also be a two-story podium with more than 70,000 square feet of retail, which will extend to two more floors below ground. The building topped out late last year and is expected to wrap up in early 2019. 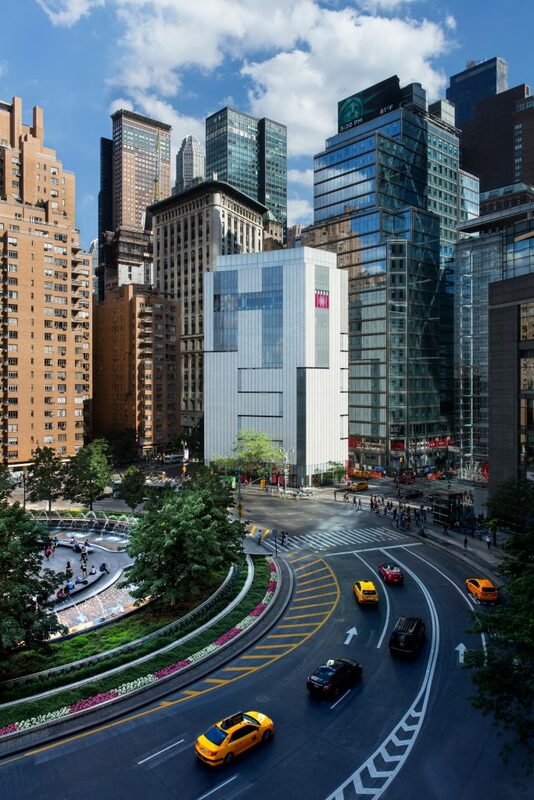 In October 2012, Lincoln Center for the Performing Arts underwent a $1.2 billion campus renovation, now presenting over 3,000 programs, events, and initiatives each year. 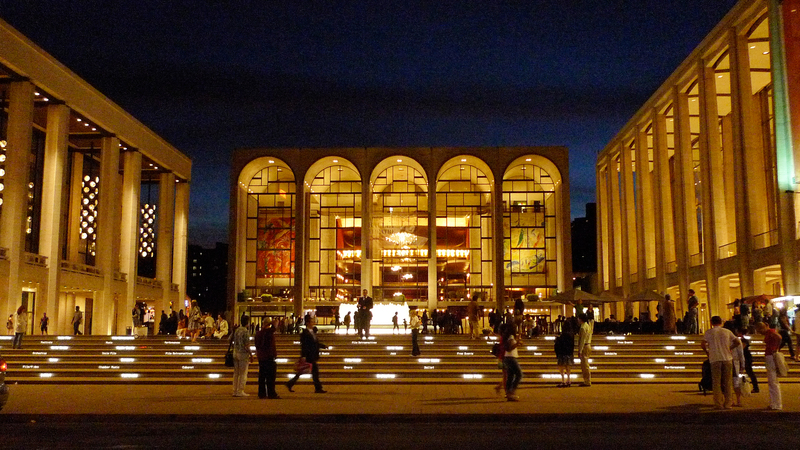 Among the organizations it hosts are the New York Philharmonic, the Metropolitan Opera, the New York City Ballet, and the New York City Opera. 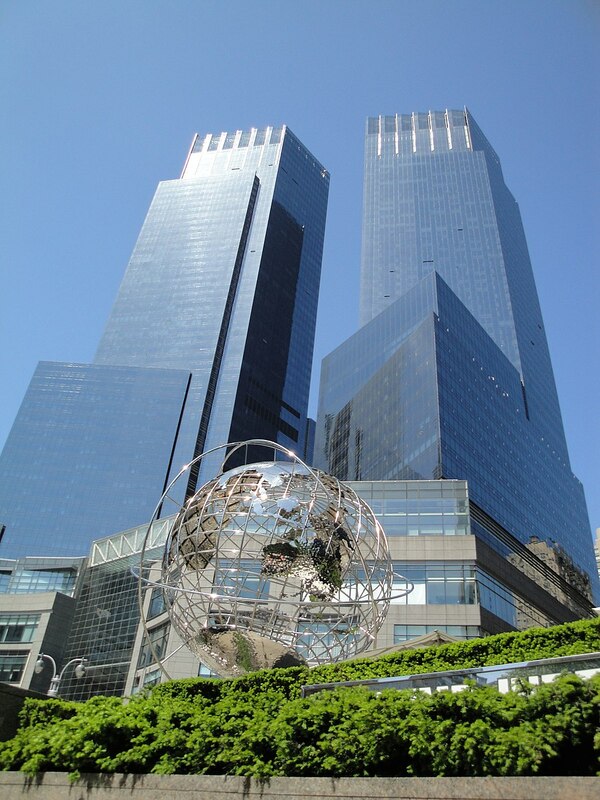 Attracting more than 16 million visitors annually, Related Companies’ Time Warner Center offers shopping, dining, accommodations, and entertainment in a 2.8 million-square-foot double tower complex. 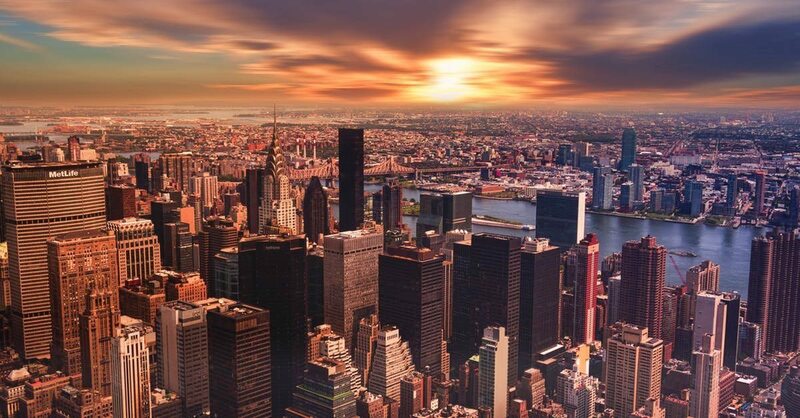 There are over 50 retail shops, a Whole Foods, the largest collection of Michelin-starred restaurants under one roof (Masa, Per Se, Bouchon Bakery, and Porter House New York), the five-star Mandarin Hotel with nearly 200 rooms, the luxury residential condominiums of One Central Park, and many office headquarters. 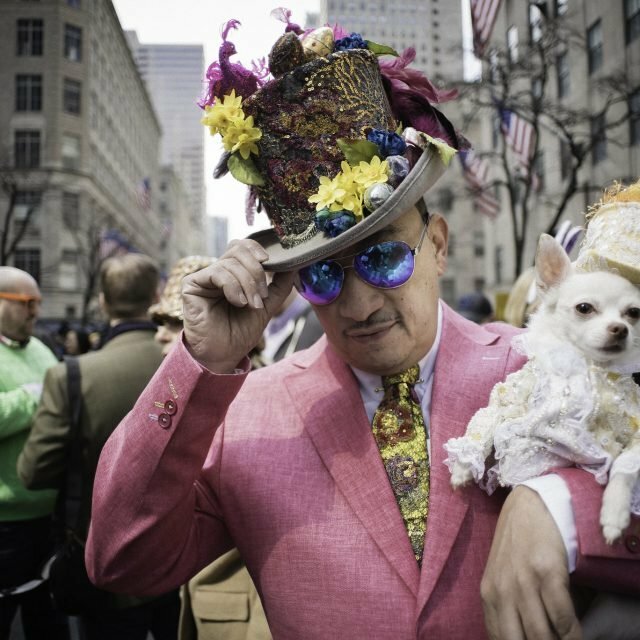 With an ill-fitting acronym, MAD champions contemporary creatives including artists, designers, and artisans. Started in 1956 by philanthropist Aileen Osborn Webb, MAD honors the creative process and a cross-disciplinary approach to art and design. Juilliard has always been the epitome of cool and it continues to be so as the school president, Joseph W. Polisi asserts, “Artists of the 21st century must rededicate themselves to a broader professional agenda that reaches beyond what has been expected of them in an earlier time. Specifically, the 21st century artist will have to be an effective and active advocate for the arts in communities large and small around the globe.” The Juilliard School was founded in 1905 and is a world leader in performing arts education. Its mission “to provide the highest caliber of artistic education for gifted musicians, dancers, and actors from around the world so that they may achieve their fullest potential as artists, leaders, and global citizens” offers more than 800 artists from 40 states and 38 countries and regions an amazing and unique education. The school offers 700 annual performances in the school’s five theaters – there is never a dull moment for the Fame inspiration. The museum is currently closed for installation but will reopen on June 12th with their Charting the Divine Plan exhibit highlighting the art of the first American scientific illustrator Orra White Hitchcock. The museum, opened in 1961, focuses on self-taught artists “whose singular talents have been refined through experience rather than formal artistic training, the museum considers the historical, social, and artistic context of American culture.” The collection has more than 7,000 artworks dating from the 18th century to today. With work spaces, sports leagues and events, you could spend all day in this Equinox. With a recent multi-million dollar investment, this outpost of Equinox Sports Club has a terrific roof deck and outdoor track, and a Mind Body Studio, a dedicated Boxing studio, a Cycling studio and new communal lounge spaces, in addition to fitness equipment, this is a true luxury fitness destination. 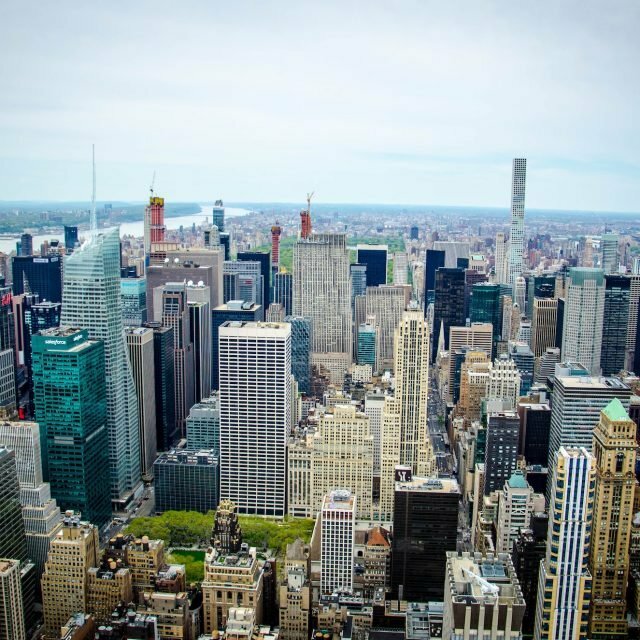 In addition to the many glam restaurants of the Time Warner Center, there are other hot spots in the area too. The more casual version of Jean‑Georges, Nougatine has a lively bar scene at night. With an abundance of celebrities, socialites, and business tycoons, Nougatine serves breakfast, lunch, and dinner, 365 days a year. The restaurant features only the freshest and finest ingredients. The newly renovated dining room by acclaimed interior designer Thomas Juul‑Hansen features a bustling open kitchen. 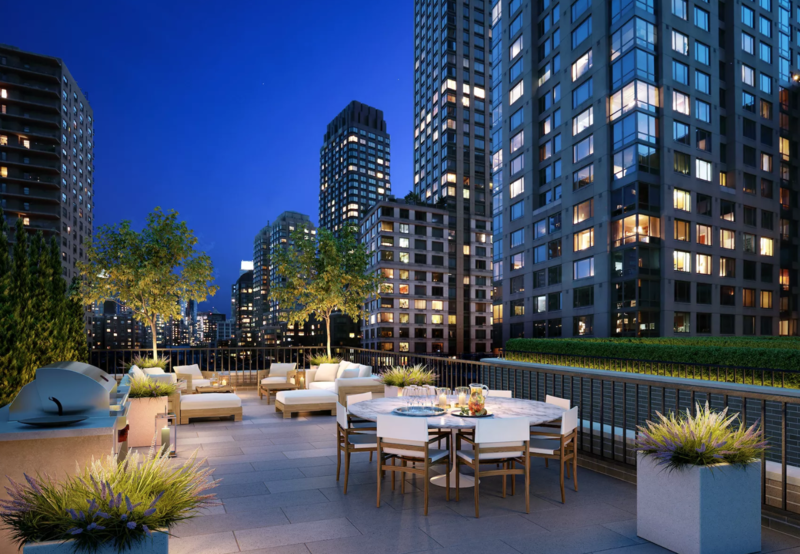 Additionally, there is the Terrace at Jean‑Georges which is a beautiful outdoor patio. Diners can sit under umbrellas and get terrific views of Central Park. Chef Daniel Boulud’s Boulud Sud is the chef’s celebration of the sun and the sea. Inspired by the Mediterranean coast, the menu emphasizes regional flavors with an abundance of fresh vegetables, seafood, citrus, grains and herbs. The wine list ranges from French rosés and Italian reds to Greece, Spain and other coastal regions. The restaurant also offers cocktails inspired by the same seasonal products found on the food menu, with a dedicated gin page as well as a robust selection of absinthes, amari, vermouths and liqueurs. For a terrific brunch and lunch with casual with outdoor seating, the Smith states they are “passionate and empowered” and place their employees, guests and community as a priority. They also work closely with local farms to provide the top quality farm to table ingredients. For a fancy night out or a pre-theater meal, Lincoln Restaurante’s location beside Lincoln Center’s reflecting pool and the Henry Moore sculpture offers panoramic views and a grass lawn roof. Their Negroni Bar and Prosecco Bar have rotating selections and also have a 350 bottle wine list focused on small producers which is constantly changing. 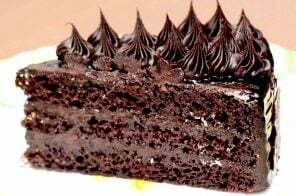 For a relaxed, Indian meal, Sapphire offers boxed lunches and buffets and caters to the Lincoln Center crew.